The Anglican Bishop of Jerusalem has condemned an Israeli police operation to seize former nuclear technician Mordechai Vanunu from his cathedral. Bishop Riah Abu El-Assal witnessed between 30 and 50 armed police "invade" the precincts of St George's Church. He said he was "very angry" that police had carried machine-guns into the church, terrifying pilgrims and staff. 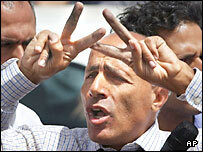 Vanunu - freed from prison in April - is being held on suspicion of passing on classified information, police say. I asked them, why do you come in such numbers? Why do you carry machine guns into the cathedral? Bishop Riah told the BBC News website Vanunu was seized as he ate breakfast in the church's guesthouse. Vanunu, a convert to Anglicanism, has lived there since his release from an 18-year jail term for treason, following his disclosures about Israel's nuclear weapons programme. The bishop described how 15 to 20 men wearing bullet- proof vests and carrying machine-guns burst in, accompanied by officers in civilian clothes. "I asked them, why do you come in such numbers? Why do you carry machine-guns into the cathedral?" the bishop said. "You've come in as if you are coming after criminals. You've terrorised these pilgrims and people at the guesthouse." Ninni Rydsjo, a Swedish aid worker staying at the hostel, told Associated Press: "We were sitting... having breakfast at 0900, then all these military stormed in, running everywhere with heavy arms. Pilgrims from a Methodist church in Brighton, in the UK, were also shocked by the incident, the bishop said. Police searched Vanunu's room, taking notebooks, mobile phones, laptop and camera, before leaving with him, he said. The bishop was not allowed to speak to Vanunu during the "heartbreaking" raid and had not managed to contact him since. The police have declined to discuss the nature of Vanunu's alleged disclosures. He was released on strict conditions - including a ban on speaking to foreign media, which he has breached.